I met with members of a book club who selected my book Kapoho: Memoir of a Modern Pompeii, as one of their selections. The hostess, Jill Thornburg, was incredible. She had Sears ads in the bathroom as toilet paper and she served Vienna Sausage, Kapoho style. They really knew the book. One woman who was stationed in Hawaii with her military husband in the 60’s said she got to know my soul while reading the book; that it was more than a group of stories. Each discussed their favorite story. I was asked to discuss writing and other aspects of the book. They expressed gratitude for the discount my publisher had given to their Kapoho purchase. What a lovely visit back to Kapoho. And in Denver, too. Phil Abbot, well-known radio personality in Hawai’i passed away this week. I knew him as Phil Miyamoto; he was a first grader and later a third grader in my classes in Hilo. I have not seen Phil since third grade, but his late artist mother Kay had kept me updated on PhiI’s life from afar. I regret not calling Phil during my last visit to Hawai’i as promised, but we did email two years ago when we both worked on an obituary story on his mother. I was a young inexperienced teacher when Phil was in my classes and he taught me to become the kind of teacher students needed. I had a rule in my class: Whenever a poem comes to you to be written, take your chair and sit under that tree and write. Phil was the only one who took full possession of this rule. During math and science classes, he would take his chair, pencil and paper, look at me, I would nod to him, and he would be under the tree, writing mostly haiku. He was the only one who wrote throughout the year. Yes, he usually chose math and science periods to turn poet, but he did all his work. A few times, other teachers spoke to the principal that my students were being unsupervised outside of the classroom. When the principal came to my room to discuss this problem, I pointed to the tree and said, “I have full view of that tree.” He never approached the complaint again and I continued to be young and sort of arrogantly fearless because I had students like Phil covering my back. Phil was a leader so his classmates followed him; they liked the children he liked and were rude to others he didn’t like. There was John, I will call him, who was on welfare and was barely making it in class and I saw him being taunted by Phil and his friends. So one day I had a talk with Phil. “The children in this class see you as a leader, Phil, and when you become a leader, there’s a lot of responsibilities. You noticed, the kids are nice to kids you like and are rude and mean to kids that you don’t like. You don’t like John, do you?” When he nodded, I asked him why. His reasons were appropriate for 6 years old: he dresses funny, is dirty, smells and makes lots of disruptive noises in class. He listened intently while I told him John had no mother and his father was in jail for shooting his mother. Phil made a complete turnaround and began to include all classmates, especially John into his circle of friends. He came to me often to ask me how John was doing and wanted more details of his life. In third grade, he wrote a stage play for Social Studies. I was certain he would take the lead role but he gave it to John. He assigned roles and became the director. He showed such sensitiveness and patience that I got him a special chair with a sign that said Director as they do in Hollywood. I was so proud of him, he drove me to tears. This humility and acceptance of people from all walks of life followed him to high school and into the rest of his life. He went surfing with all kids in high school. I know because I checked on him. He always kept his protective eyes on me. Every morning he stood near the teacher’s parking lot and waited for me to drive in from Pahoa. Once he saw me drive in , he felt relieved that I had safely arrived. Only then would he begin his school day. His mother or dad stayed with him until I arrived. When he was in the first grade, he would ask his father to drive him to Pahoa so he could see where I lived. His parents totally supported both of us. My heart feels broken today for that special little boy and for the man he had become.I hope his sons will find another legacy left by their dad in this story. Thank you, Phil. My heart goes out to your family that you so loved. They’ll be fine, Phil. Believe me, as you did your first grade teacher. Look, look, I can now say that I am an internationally published author! 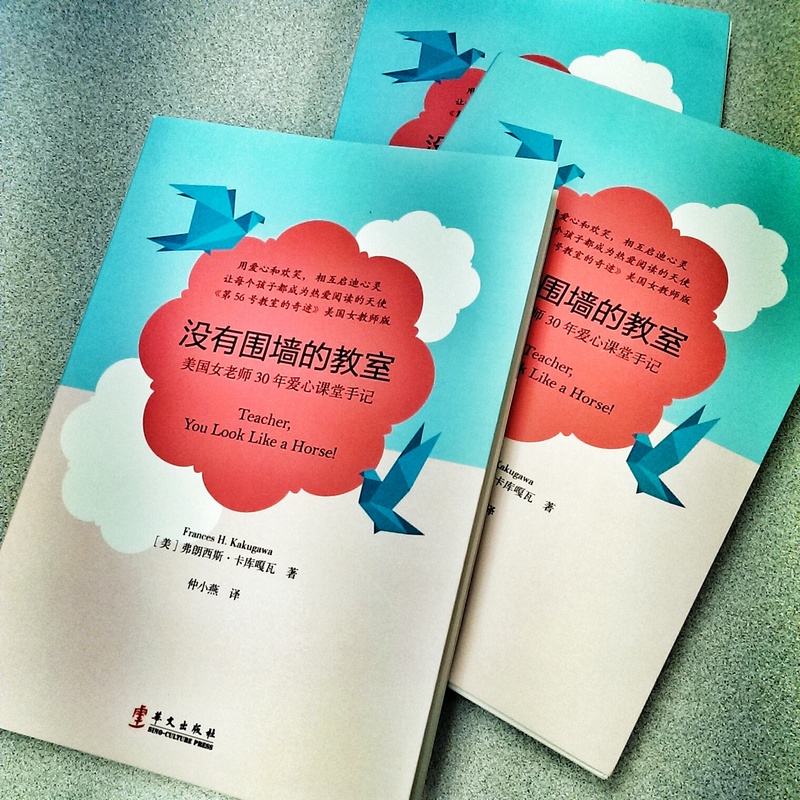 My publisher just got a few samples of the Chinese edition of Teacher, You Look Like A Horse! Do you think I should start packing my bags for a signing in Beijing? Going to have dinner tonight at Panda Express, the only Chinese restaurant in our area, to celebrate! UPDATE: According to friends we have asked, the title the Chinese publisher gave the book is “A Classroom with No Barriers: An American Teacher’s 30 Years of Memories.” I like that!